Sometimes it’s hard to associate locations in a 2D Google Map on your phone with what you see around you in the real world. That’s why Google’s Maps team is testing a new mode that uses augmented reality to add real world directions and place labels to your view of the world through the camera of your phone. 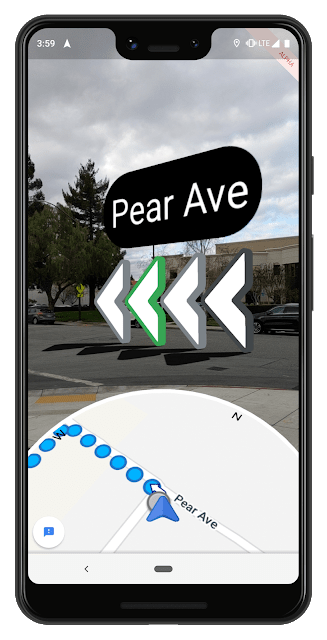 In order for the AR labels and directions to be helpful, they have to be positioned correctly over the real world places within the camera view. GPS isn’t always able to perfectly place the phone within an environment: the signal requires a line-of-sight view of the satellite above, which can be blocked by trees or tall buildings (in downtown San Francisco, for example). But Google has precise latitude and longitude data associated with the millions of images it’s captured for its Street View feature. It uses machine learning in the cloud to match the Street View images with real-world places seen through the phone camera. The latitude and longitude data for those places are combined with GPS and cell phone tower data to pinpoint the user’s location. With that done, the AR images can be placed correctly.